Best Solid Australian Precious Opal 14K Pendant pink blue green lemon red. Check Your Monitor Calibration for Accurate Image Colors! Best Solid Australian Precious Opal 14K Pendant pink blue green lemon red B5 S5 XL. Best Solid Australian Precious Opal 14K Pendant pink blue green lemon red B5 S5 XL Features-Details. Best Solid Australian Precious Opal 14K Pendant pink blue green lemon red B5 S5 XL DESCRIPTION. With Each Different Viewing Angle or Colors of Lighting, You will see the Beautiful combination of. MAIN FEATURES - CRYSTAL Transparent OPAL, B5'Night Opal', S5 VIBRANT, ELECTRIC COLORS, Solid 14K GOLD. PLAY-OF-COLOR - Moving ELECTRIC COLOR FLASH - LIME LEMON VIOLET SALMON PINK AQUA TEAL ORANGE RED, two sided, Transparent. B BRILLIANCE - B5 EXCEPTIONAL BRILLIANT Play-Of-Color (BEST'Night Opal'), Moving ELECTRIC COLOR FLASH in Color Clouds. S SATURATION - S5 VIBRANT/MIRROR FLASH COLOR SATURATION Intensity (BEST). SIZE/SHAPE - 8x6 mm Oval Solid CRYSTAL OPAL (transparent, 2 sided color). JEWELRY SPECS - 16.7x10.7x5 mm. 1.57 Grams of 14K Solid Gold. N BASE TONE - Solid Precious Crystal Opal, transparent, 2 sided Play-Of-Color. This is a Very DESIRABLE Quality piece of LEGACY TREASURE Opal Cross Jewelry for Generations to come. Every Natural Opal is Unique. It is part of their appealing beauty. This Exceptional Solid Crystal Opal Pendant in Solid 14K Gold, is one of our very best this year with an 8x6 mm Oval SOLID CRYSTAL OPAL with B5'Night Opal' EXCEPTIONAL BRILLIANT Moving ELECTRIC COLOR FLASH - LIME, LEMON, VIOLET, SALMON, PINK, AQUA, TEAL, ORANGE and RED in S5 VIBRANT, MIRROR SATURATED Play-Of-Color changing ELECTRIC Shapes, Colors and Patterns. You'll Catch Everyone's attention with the BEST'Night Opal' EXCEPTIONAL BRILLIANT B5 ELECTRIC FLASHES and Patterns. These CRYSTAL OPAL FLASHES and Patterns in Beautiful colors are visible from directional viewing angles and can be enjoyed in moderate and low lighting levels. Seen in direct Sunlight or moderate Lighting, the colors and shapes are sure to catch admiring attention. The 8x6 mm Oval natural Australian Crystal Opal weighs. 30 carats with transparent Beauty that captivates all who see it. If you see this combination of BEST B5'Night Opal' EXCEPTIONAL BRILLIANT FLASH and BEST S5 VIBRANT/MIRROR COLOR SATURATION you can't easily look away from it. Everything about this Beautiful CRYSTAL Opal Pendant is an Excellent Value. 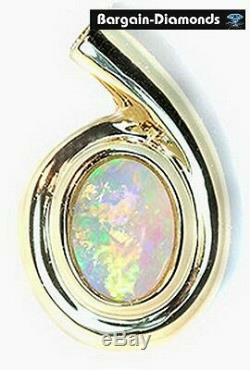 When You wear this LEGACY TREASURE Solid CRYSTAL OPAL Pendant, You know you own a Top Quality piece of Opal GemStone Jewelry. 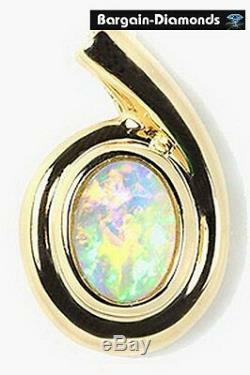 Cast in 1.57 grams of Solid 14K Gold , Your Legacy Treasure Opal Pendant measures 16.7x10.7x5 mm in overall dimensions. (1 inch = 25.4 mm). The Precious Solid Crystal Opal's Base Density is a Transparent Crystal , appearing as a clear Tone (clear enough to see black print through it). This beautiful Crystal Opal Pendant was hand selected for our loyal customers. These combined characteristics of excellent, One-Of-A-Kind natural Solid Australian Crystal Opal with a quality 14K Pendant casting are what Our Loyal Customers Expect from MyLegacy-Treasures. 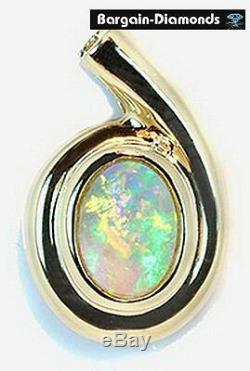 At a VALUE price like this, you can own a Best Quality 14K Crystal Opal Pendant. 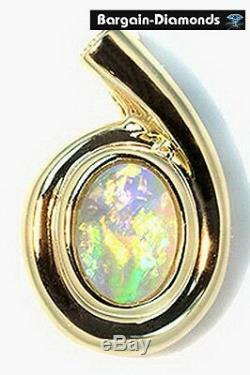 We recommend this Beautiful Solid Crystal Opal 14K Pendant for your consideration. Opportunities to acquire a Crystal OPAL Pendant with these Beautiful Colors and Patterns of this quality don't occur often. And the cost of Opals and Gold are rising rapidly. If You see My Color Patterns Flash, You Have to Look at Our Beauty! OPAL - Precious Solid Crystal, natural, transparent. SIZE - WEIGHT - SHAPE. 8x6 mm Oval Solid Crystal Opal. 16.7x10.7x5 mm, 1.57 Grams of Solid 14K Gold. BASE NAME - DENSITY # - COLOR. Crystal (XL) - NO DENSITY - Pinkish transparent TONE. PLAY OF COLOR BRILLIANCE #. B5 EXCEPTIONAL BRILLIANT (BEST'Night Opal' - color seen in low light). Moving ELECTRIC COLOR FLASH - LIME, LEMON, VIOLET, SALMON, PINK. S5 VIBRANT/MIRROR FLASH POC SATURATION (BEST). Moving ELECTRIC Directional FLASH Patterns, two sided. CRYSTAL OPAL, MOVING ELECTRIC COLOR FLASHES, VIBRANT/MIRROR, e-BRILLIANT. 100% OF FACE OF OPAL. Directional P-O-C VISIBLE Many VIEWING ANGLES, two sided. OPAL GRADING Used at MyLegacy-Treasures. Precious, natural Opals are Unique, Beautiful Creations. Is it a'natural' (made by God, not by man) Opal? Are they properly representing this gemstone? Is it'worth' the price they are asking? If they claim a special pattern, coloration or characteristic, is that claim generally supported by a recognized professionals and opal industry associations? Any decent Opal can't be'revealed' in 1, 2 or 3 photos. Demand more of your Opal Dealer than a GemStone Dealer. If photos are offered, are they of good enough quality and quantity to let me see and appreciate what this Opal GemStone will look like when it is in my hands? MyLegacy-Treasures strives to consistently, fairly represent every item we sell so you will enjoy it as much in your hands as you did when you first saw it online. We grade our Opals according to the guidelines of the Premier Opal expert, Dr. Paul Downing ("Opal Identification and Valuation"), Australian and international opal industry associations and the GIA for other Gemstones. We list the most easily seen and identifiable opal valuation characteristics in our postings to help educate our clients and clearly classify each item we offer. And we use a carefully calibrated professional system of lighting, digital cameras, optics, software, video graphics card and monitor to offer photos that fairly depict each GemStone. We tend to under rather than over-emphasize our Opals so you will probably believe it is even better'in hand' than the online photos. Use the Information boxes above to get a simplified overview about this Precious Opal and its characteristics. View MyLegacy-Treasures other auctions below. View MyLegacy-Treasures Product Showcase NOW. PHOTOGRAPHING OPALS Photographing Opals to show their color range, intensity of color, contrast between the Opal Play-Of-Color and the base color or background color, etc. Even if the bright Opal Colors could be "accurately" captured by a camera that could see what our eyes see, the tonal range of an excellent Opal far exceeds the capabilities of our computer monitors/video cards/etc. We Try to show you the'personality and character' of every Opal we sell without artificially enhancing the contrast, tonality or color saturation beyond what you will see with similar lighting once it is in your hands. Our photos depict this gemstone as you would see it in direct sunlight or with a bright tungsten light 12"16" from the gemstone. OPAL TYPE, Origin & Location This is a natural (untreated) Solid Precious Crystal Opal from Coober Pedy, Australia. As Crystal Opals, they are among the most rare, sought after of all opals. This particular Solid Opal has Precious Play-of-Color visible from both sides of the opal (2 sided - see last photo). SIZE - WEIGHT - SHAPE Opal sizes are listed in millimeters (25.4 mm = 1 inch), just like all other gemstones and the jewelry mountings for them. Opal weights are listed in carats, like other gemstones. Thickness of the opal is a major factor in the carat weight of a precious opal gemstone. OPAL BASE NAME - N# - COLOR N1 to N4 Opals have base (density) numbers of "BLACK". N5 to N6 Opals have a base (density) of "Semi-Black". 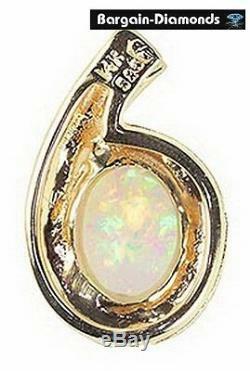 N7 to N8 Opals have a base (density) of "Light" N9 Opals have a base (density) of a "White" Opal. Crystal Opals that are transparent may have no base density unless placed against a light or dark background. However, crystal opals may have a color cast. The Opal Base density could have a color: a neutral black or grey; blue; green; brown; yellow; orange; straw; pink/red;'pearl'; etc. This base coloration may be caused by the Opal's Play-of-Color. PLAY OF COLOR BRILLIANCE # The Play-of-Color Brilliance of an Opal is rated on a scale of B1 to B5. An Opal may have an area of higher Brilliance that is large enough in proportion to the size of the gemstone that we may list 2 Brilliance numbers for the opal with text describing why, where this brighter area is located and telling what the photos probably cannot accurately display. MyLegacy-Treasures does not sell opals with a Play-of-Color Brilliance below B3. Not Precious Opal - aka - Common Opal, Potch, Jelly, Mexican'Fire. P-O-C Only in Bright Light/Direct Sun. Fair P-O-C in Bright Light/Direct Sun, DIM P-O-C in Moderate Light. Bright in Bright/Direct Sun, V. Nice in Moderate, Fair in Lower Light. B3.5 - VERY BRIGHT P-O-C. Bright in Bright/Direct Sun, Bright in Moderate, V. Brilliant in Bright Light/Sun, Crisp/Saturated Color in Moderate, Good in Lower Light. B4.5 - VERY BRILLIANT P-O-C. (slightly lower than B5) Exceptional in all other lighting, V. Exceptional Bright, Crisp, Saturated Color in all lighting (BEST'Night Opal' - color visible in low light). COLORS SEEN IN THE PLAY-OF-COLOR Greens and Blues are the most common of all Opal Play-of-Color. Red is generally considered the most valuable of all Opal Play-of-Color. Less common colors can be any color of the visible spectrum from Violet, Purple, Royal Blue to Cherry Red, Flame Colors, Magentas, Pinks, Oranges, Golden Yellows, Peacock Green, etc. What colors are seen, in what shape or pattern and from which viewing angles depends, in part, upon the viewing light used. The best light source for viewing a precious opal gemstone is one that does not change. We recommend direct sunlight or 12" to 16" from a bright tungsten lightbulb. Your opal will look different in different kinds of lighting. Sunlight and tungsten bulb lighting will tend to bring out more warm tone colors - reds, oranges, yellows magentas and purples. Fluorescent lights and light filtered through a diffuser is not satisfactory. COLOR SATURATION Color Saturation, the richness or depth of color, is an important factor in the pricing of opals but less so in the enjoyment of them. You will probably find that you enjoy the beauty of one opal with a pale or pastel color saturation. And you might enjoy some bright or rich color saturation levels seen in another opal. We list Color Saturation of an Opal as - PALE, PASTEL, MEDIUM, RICH and VIBRANT/MIRROR as appropriate. S# COLOR SATURATION TABLE DESCRIPTION. Colors are weak, highly diluted by white, grey, black. May need bright light to best view. May be highly desired, esp. Colors not the highly saturated/pure/rich. May be desired for fashion. RICH, PURE, fully saturated colors. Exceptional VIBRANT, Saturated Color in all lighting (like a Mirror of colored glass). PLAY-OF-COLOR FLASHes, SHAPES & PATTERNS See our written description below the photos for more information about special Opal Play-of-Color Flashes, Shapes and Patterns. PLAY-OF-COLOR VISIBLE PERCENTAGE Every natural Opal gemstone is unique. Our photos probably will only capture some of the play-of-color, patterns and coverage across the entire face of the opal gemstone. The very best opals have Play-Of-Color across the entire gemstone. Most precious opals do not have play-of-color across 100% of the gem and are beautiful. Some precious opals have a mirror flash, a Harlequin or other unusual pattern, ribbons of color or many variations that are both beautiful and stunning while not covering 100% of the opal's face. We list if the opal has 100% play-of-color coverage because this is more costly. You may have to rotate or pivot the gemstone and/or change positions between you, the opal and the viewing light to see play-of-color from a particular area of that gemstone. PLAY-OF-COLOR VIEWING ANGLES The most expensive opals have wonderful Play-of-Color from every viewing angle. Opals with patterns, Harlequin, chinese writing, mirror flashes, rolling flashfire, pinfire, etc. Usually display the best of their beauty from certain directional viewing angles. This can result in a sudden "SHOCK" of color or pattern that splashes forth to delight your eyes. Sometimes an opal is at its best if lighted from the side or from slightly'above' which would make it an ideal opal to use for a pendant. Some opals are at their best and brightest'face up' - when the viewer has the light source over her shoulder to view the opal face-on like a ring stone. If an opal is highly directional or has particular beauty in our photos from specific directional viewing, we will list it as'directional' in our description. Like its Owner, Every Opal is Unique and One-of-a-Kind. MyLegacy-Treasures for Opals and Much More. MyLegacy-Treasures Hand Selects EVERY Opal, Gemstone and Jewelry Item We Sell. We offer good/better quality opals at pricing that are a fraction of typical wholesale/retail pricing. Some of our items are pictured below. Also see our store's "BEST OF THE BEST" listings. Your Treasures ARE Your Legacy. Canada, Mexico, the Caribbean, the Americas, Europe, Australasia, Japan & U. State and Federal Laws prohibit for Health + Safety reasons the return of body piercing jewelry like pierced earrings if they have been worn. You Are Important to Us. For over 20 years, MyLegacy-Treasures & LifeStyles-Collections have been pleasing select customers with quality products and services. We want you to enjoy your MyLegacy Treasure/Gift for a Legacy of years to come. We want your repeat business. We want to help you to fairly resolve any problem. We believe in the "Golden Rule" and the 10 Commandments as taught when we attended school - Do unto others as you would have them do unto you. No item we sell will knowingly be misrepresented. We always try to accurately describe each item's features & photograph it using tungsten (room light equivalent) or daylight-balanced lighting. We do not artificially adjust contrast, color saturation (intensity), exposure, etc. To unrealistically make a collectible, color change gemstone, a pastel or lower quality item appear substantially different on the internet compared to holding it in your hands under the same intensity and color balance of lighting. Our photos may be 1:1 (life size), smaller for large items or magnified larger than life size to show detail and quality. Magnified images may show minor flaws not visible to the unaided eye. Solid Gold Content, Gemstone Treatments. Sizes may be listed in inches and U. Ounces or in millimeters (25.4mm=1 inch) and grams or carats. 10K, 14K, 18K Gold is for Solid Gold Content - not plated/Vermeil/etc. All Natural Gemstones & Opals We Sell are Real, Natural Creations of God. Most Gemstones have been Treated to Enhance the Natural Color & Beauty of the Stone. Treatments, if known, will be posted along with any special care instructions. We Inventory literally Thousands of loose natural Opals, Gemstones in every Color of the Rainbow & All Fashion Colors. Our Worldwide contacts give us access to Literally any Gemstone - Rare, Jewelry, Collectible & Investment Quality. The item "Solid Opal 14K gold Pendant pink green blue lemon violet red Australian love" is in sale since Wednesday, February 10, 2010. This item is in the category "Jewelry & Watches\Fine Jewelry\Fine Necklaces & Pendants\Gemstone". The seller is "bargain-diamond" and is located in Atlanta, GA. This item can be shipped to United States. Length (inches): Necklace not included.